Miscellaneous: Dr. Faustus takes its protagonist from the German Faustbuch (1587), which was based on the life of an actual German astronomer and necromancer named Johann Georg Faustwho died about 1540. Rumored to have exchanged his soul for supernatural powers, he entered German folklore as the consummate naughty trickster, usually indulging in callow mischief. In Marlowe’s play, however he is transformed somewhat, and possesses a certain tragic distinction, though in no way is he exculpated from his crimes. Marlowe is also credited with transforming the English blank verse line, giving it a vigor and range of expression that was to prove a strong influence on his contemporaries, including William Shakespeare. FAUSTUS: “The reward of sin is death?” That’s hard. Si peccasse negamus, fallimur, et nulla est in nobis veritas. “What will be shall be?” Divinity, adieu! Is promis’d to the studious artisan! Doctor Faustus by Christopher Marlowe is an age-old tale about a man who makes a deal with the devil, swapping his soul for knowledge and power. Initially, Faustus imagines all the things he will do with the powers he will be given, reroute the Rhine and maybe even give himself a kingdom for example, but in the end he is little more than a conjurer performing parlor tricks for people’s amusement. Right from the start of the play we see Faustus, a man of incredible intelligence… too smart for his own good, debating the merits of various disciplines from medicine to philosophy and ultimately divinity. Having received his doctorate in divinity from a world-renown school, Faustus should have a better understanding of God’s mercy and the nature of Grace, but he seems to lack a grasp of the basic elementary concepts of Salvation, Redemption and God’s limitless, unconditional Love. Dr. Faustus’ arrogance and pride in regards to his own geniusness shines through and we get a picture of a man jaded by religion and desiring forbidden knowledge for his own personal gain. For all Faustus’ plans, dreams and schemes of political influence and power, to be “a mighty god,” as the play progresses he becomes baser and more ridiculous until he is on the level of a clown and a jester, performing parlor tricks for the scholars and locals and using his unfathomable powers to play pranks on the unsuspecting. Marlowe wrote Doctor Faustus toward the end of the Renaissance, a period of time that valued the pursuits of knowledge and self over relationship with God, and meant for the play to be both cautionary and commentary. Through Faustus’ questions put to Mephistophilis (his personal assistant from Hell… literally), Marlowe shows that all things have their origins in God. As the kingdom of Hell is set against Heaven, it because an exercise in futility and vanity for Faustus to pursue all the hidden knowledges because he can not follow them to their ultimate ends, God Himself. Several times in the play (which covers a 24 year period as that is part of Faustus’ contract) Faustus shows signs that repentance is weighing heavy on his heart. Faustus is caught between the Good Angel’s council to repent and that God will forgive him, and the Evil Angel, who first tries to entice Faustus to follow Hell, and ultimately threatens him that if he repents devils will viciously tear him apart. All the way to the last few days, God continues to call to Faustus and tries to turn his heart to repent and return, but Faustus refuses every time. With the final call, Faustus shows how cruel and vulgar he has become by sending devils to torment and kill the old man who had tried to inspire him to turn back. One of the fascinating things about Doctor Faustus is that it has historical origins. There really was a Dr. Faust who was rumored to have sold his soul to the devil for supernatural knowledge and abilities. While Doctor Faustus by Christopher Marlowe isn’t one of the best plays of the Elizabethan era, it is intellectually and morally fascinating. It is possible that Marlowe would have become Shakespeare’s equal had he not died at the age of 29. Also, as I read this play it occurred to me why this type of literature can be so difficult for readers. Unlike novels, which include every detail of the story and make it much easier for the reader to be a passenger in its telling, a play requires you to imagine the missing information and to set the timing. Plays are much more interactive than novels. 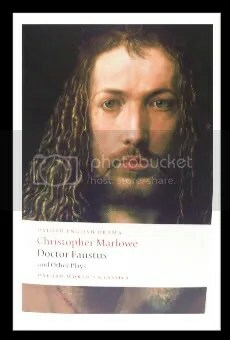 For flexing my brain and using “shoulder angels,” I give Doctor Faustus by Christopher Marlowe 4 out of 5 stars. The name of Faustus’ familiar spirit is Mephistophilis, which reminded me of John Lovitz’ SNL performance in the following clip. What is hilariously funny about it is, it’s actually fairly true to the play. Of course, it’s an 18-year-old hair dresser named Vonda Braithwaite instead of Faustus, but for the most part it’s all there. Lol… the ending is different, too, though you have to wonder would Mephistophilis have stood a chance had the doctor taken his case to Judge Wapner?